Mom of Many Words: Was it karma that I was klunked by Clynk? About a week ago you might have witnessed me skulking around the local supermarket entrance. I was talking to Spouse on my cell phone while waiting for a store clerk to return with my eyeglasses from the bottle redemption center. Why, you ask? Because, honestly, what happened could only happen to me. I think. Spouse and I are pretty good about recycling and collecting bottles for return, though we tend to procrastinate over bringing them to the recycling center. Fortunately, our local grocery store has it own special container on the other side of the parking lot for this very purpose. 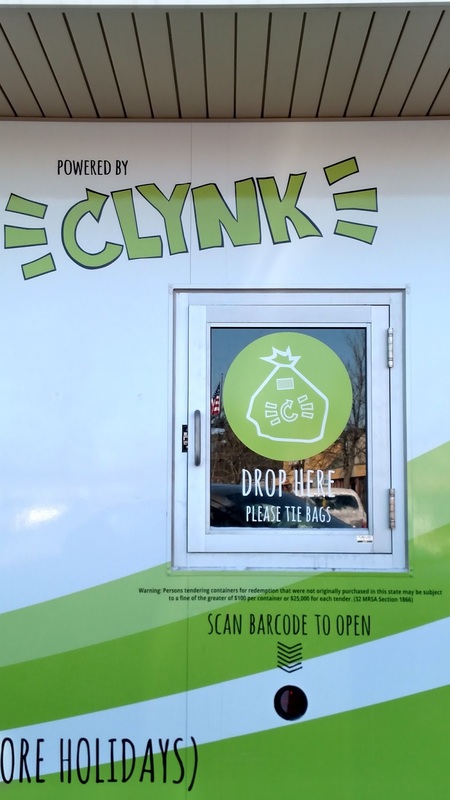 The redemption program is called Clynk. Isn’t that cute? You can park your car right next to the facility, scan the little UPC code on your filled bags and toss the returnables through a door instead of lugging big, bulky bags into the store. It sounds so easy, and it is. Spouse had loaded a couple of bags into the trunk of my car a few days earlier, so I had no excuse for not dropping them off. On my way to the grocery store I pulled up to the Clynk facility, parked my car and grabbed the bags of bottles out of my trunk, ignoring the signs suggesting that drivers turn their engines off. First I had to get the hatch opened, which proved to be a challenge. I swung the UPC code in front of the scanner and heard the official beep signaling that I had seconds to pull that heavy sucker open and toss the bags into the container. Immediately I lost all control of the situation. As I struggled to hold the hatch open and throw the first bag in, the door slipped and smacked me in the back of my head. The bag was already in full motion as I flung it through the opening at the same moment that my eyeglasses – which had been bumped off my face from the force of the door smack – torpedoed into the container right past the bag of bottles. I stood there alone in the chilly parking lot rubbing the rapidly growing bump on the back of my head. Was this karma because I didn’t turn off my car while recycling, as the sign (which came just short of listing every species I was saving) had gently suggested? After tossing the second bag to the side of the other one, I knew there was only one thing to do. I drove over to the supermarket and sheepishly approached the customer service counter. How do I explain that my eyeglasses had a mind of their own and decided to catapult into an eternal pit of returnables? Somehow I explained what happened and waited for the clerk to snicker or snort or something. The next thing I know, another store clerk was walking toward the Clynk container and I was on the phone telling Spouse about this embarrassing incident. He had more of a reaction than the store clerk, which made me wonder… how often do they need to retrieve items from the cavernous bottle vacuum protected by a door that could be used on armored cars? Maybe this is a common occurrence that should be noted with a warning, right next to the suggestion to turn your car motor off. My eyeglasses were returned in just a few minutes and I finished my shopping without incident, though that bump on my head was a reminder of what you might deem a low point for a few days. There has to be a moral to this story, I thought to myself. Why else would I be attacked by a door, earn a bump on the noggin and lose my glasses - just because I broke a sort of rule that was really just a suggestion? Apparently, the moral of the story is that when Spouse and the kids don’t provide me with enough material for my column, God provides. And God definitely has a sense of humor.